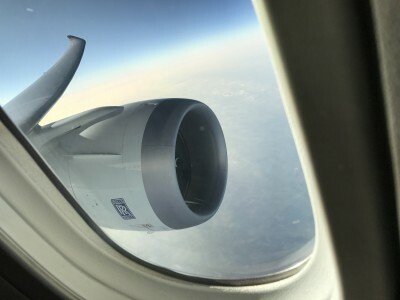 Last January Rob wrote about the LAN flight from Santiago, Chile to Frankfurt via Madrid when it was on special offer, with the option of only flying the bit between Frankfurt and Madrid. 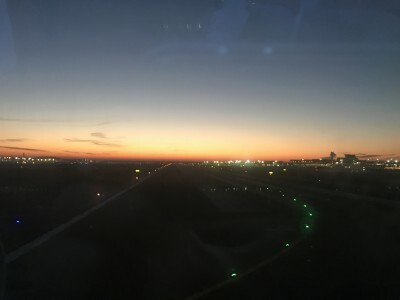 As a 2 hours 40 minutes flight is a good way of finding out whether a plane is suitable for a 13 hours flight we decided that I should review the LATAM flight from Madrid to Frankfurt instead of flying straight back to London. We booked the flight using Avios. LAN / LATAM services can only be booked on ba.com or iberia.com, and not avios.com. My one-way flight was a bargain at 15,000 Avios plus £17.20 of tax. 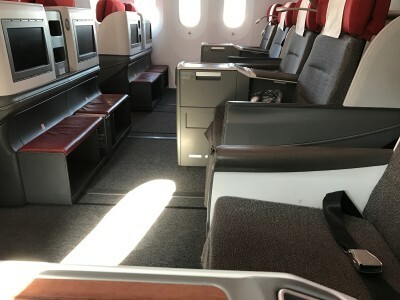 Do check cash prices on the LATAM site as well as occasional special offers mean that the route can be exceptionally cheap (under £150 one way). After visiting the Sala Velazquez Iberia VIP lounge at Madrid Bajajas I made my way to the gate which took just a few minutes. This LATAM flight is operated by a brand new Boeing 787-9. 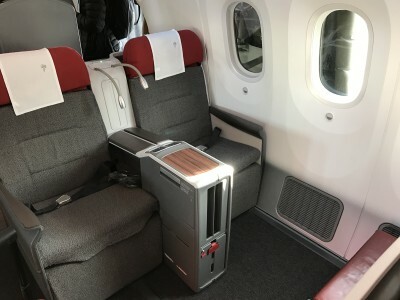 The business cabin has 30 seats in 5 rows with a distinctly old-style configuration of 2-2-2. My seat was a window seat in the last row of the business cabin (5A). 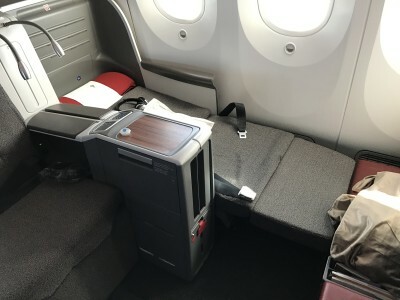 There was a good amount of storage by the seat, although the crew insisted that even items tucked under the footrest had to go in the overhead locker during take off and landing. As you can see in this picture there is not a lot of room in between the seats and there wouldn’t be much privacy on a busy flight. As we were waiting for the last passengers to board the plane drinks and nuts were served. The service standards had not been reduced even though this was technically now a short-haul European flight. The entertainment prorgram was great. I think I counted around 100 movies and there were various TV shows as well as music albums. You don’t get that if you fly Iberia or Lufthansa between Frankfurt and Madrid. I watched Snowden – great movie! After take off I tested the bed. It was indeed fully flat and rather comfortable. I think I could have slept comfortably if I had been on it for the full 13 hours between Madrid and Santiago. Meal-wise, the flight was at a bit of an awkward time with a 3.05pm departure. 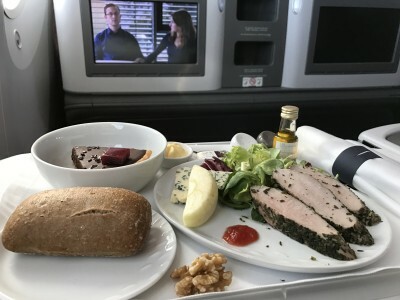 LATAM chose to serve a light meal which was a salad with chicken, some cheese and bread with a chocolate cake for desert. To give you a better impression of what you can expect, here is a short YouTube video of the LAN flatbed flight from Madrid to Frankfurt. You can subscribe to our YouTube channel via this page – this is the same link to visit if the video does not automatically appear below. There are two ways of looking at this flight – as a 160 minute hop between Madrid and Frankfurt and a potential 13 hour flight between Madrid and Santiago, Chile. The LAN flight is, clearly, an outstanding alternative to a European short-haul airline when flying from Madrid to Frankfurt. 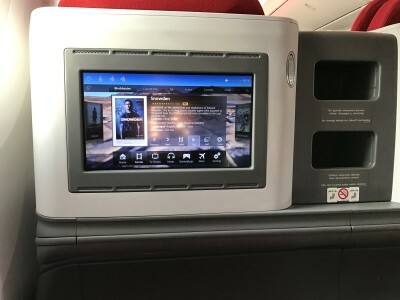 You get a comfortable seat that can fully be reclined, the selection of movies was great (versus non-existent on other airlines on this route!) and the food was good. If the flight times work for you, you’d be crazy not to choose this option. However as a business class product on a 13 hours flight the LAN flight is probably not ideal. This is primarily due to the 2 x 2 x 2 seating arrangement. If you are travelling alone you will be very close to your seatmate, without any separation between the seats, and I wouldn’t feel too comfortable. Even when travelling with your partner or a close business colleague, you are still sharing an armrest and drinks table throughout the flight and you might prefer additional privacy. The LATAM website is here if you want to find out more about their services. It’s also makes for a great way to travel between Sydney and Auckland if you’re down that way, as it stops there both directions on the Sydney-Santiago flight. Especially liked the option of a Pisco Sour as a pre-departure drink! +1 I have booked this journey in may. Looking forward to it. I bet it’s miles better than BA! What are the point options for that flight? It’s also perfectly fine in Y, for which I paid £60 rather than 10000 avios + whatever. I’ve done both hops (FRA+AKL). I would definitely take LATAM again on the FRA route. However we also had a QF A340 with Lie Flats on one flight between AKL+SYD which I’d take again in a heartbeat compared to LATAM. Found both crews on LATAM average (often not even bothered talking English), seats good, food okay, drinks ok. QF was better in all aspects! (But this probably is moaning on a high level). Plus we had a delay (as it seems often happens on the AKL-SYD) and QF simply has plenty additional flights which would make it easier in terms of IRROPS. flight but not a great long haul product if compared to Qatar, Cathay or American Airlines latest offerings. It is however light years ahead of cramped world with significantly wider seats and just 6 across versus BAs 8 across. It’s very similar to qatars 777 business class layout. A while back and wouldn’t hesitate in choosing this airline ahead of BA, but then I would choose almost any one over BA long haul at present. I recently did the akl-Syd hop. I did AKL-SYD 11 months ago March in Y on this LATAM plane. Perfectly acceptable, sparkling clean plane and really nice crew. In Y I’d prefer it to Qantas. I’d probably prefer this plane over Air New Zealand as well. Avoiding AKL right now though due to the nasty way I was treated by contracted LATAM ground staff in AKL. I dared to ask for Lounge Access in AKL flying Y. Temporarily I was low status however I was connecting to a OneWorld J flight same day in SYD to Europe. When I politely queried their denial of lounge access mentioning I believed OneWorld rules allowed lounge access on a Y flight if connecting to a J flight same day, I got 2 hours of nastiness from LATAM’s contracted lounge staff. I think LATAM’s subcontracted Air New Zealand ground staff thought I was a tall poppy however polite I was. (NZ’ers will “get” this). So very nice plane and staff but if I ever take it, it’s be at the SCL end of the flight. I’m doing Frankfurt to Madrid at the end of March and rather looking forward to it. Should get a proper dinner as it’s a 1930 departure which is perfect for my plans. £133 cash fares are fairly open over the next few months in that direction at least, so I’m disinclined to use Avios. Given it was not much less than £100 in Lufthansa or Iberia economy it seems like a no brainer to me. Any tips on lounges at Frankfurt? I’m BA Silver so in theory I should have choice of any One World plus whatever LAN use. Cheers, won’t have a lot of time as full working day in Frankfurt but should manage a bit of lounge time. 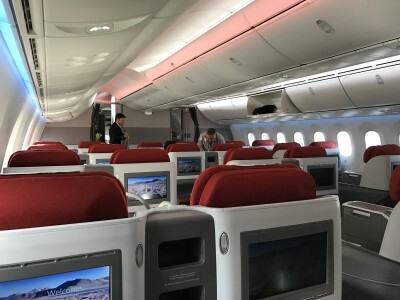 It may be 2-2-2 layout but it looks so much less crowded than BA CW 2-4-2 which is positively claustrophobic on their 787! How is aisle access when seats are in flat bed mode? BA 787 in CW is 2-3-2, nowhere near as bad as 777 which I almost refuse to fly on now on BA. BA’s 8 across is in ying yang style though, so unless your feet are wider than your shoulders, it gives similar room to this 6 across. I’m no BA fan but this obsession with how many seats per row is like a child’s ge of Top Trumps. If you don’t care about comfort and privacy, you may as well fly at the back of the plane. At least at the back of the plane you somewhere to store your glasses, you don’t feel exposed, and you aren’t sitting staring at a stranger’s face. I guess a lot of it comes down to personal choice. I find window seats in Club World to be very private. I can’t see anyone’s hands, legs, feet etc. As to face, the screen deals with that, only during the few seconds of meal/drinks service is that exposed. But on a BA 777, only 25% of the seats are those private window seats. And you have to climb over the feet of a stranger to get in and out of them. You should try AAs 77W. Every seat is private with direct aisle access. You don’t see another person from your seat. (You don’t even see your companion if you are in the middle pair). Loads of storage space and table space. Bose headphones. (Plus decent pillows, duvets, and amenity kits). BA CW feels like a premium economy product by comparison. But BA and AA charge the same prices. BA really should be ashamed to be offering their product as Business Class. Great for a 241 redemption, but not worth paying for. Last time I flew CW on 777 and 787 there was a drawer by my feet to store stuff. I know because I left something important in it when I left the plane, which was not too drastic since I was flying to Canada. I want to see my wife although we have been married for 41.5 years! @mark2. Trying to access the drawer when the seat is in ‘bed mode’ is a mission and as such it’s not a practical place to store one’s glasses. I tend to agree. I am far from the biggest fan of CW but, given a choice on a 13 hour flight of CW or the LAN seat, I would choose CW purely for privacy reasons. Yes, me too, especially when travelling with the other half, raising the CW window is always a thrill. Re “similar room”. BA is 20W by 72L. LATAM is 23W by 75 long. 20% more space on LATAM. An extra 3 inches makes a noticeable difference! I have a BA 2-4-1 voucher that I would like to use in an IBERIA flight starting in Madrid or Barcelona, do I need to phone BA as I don’t see the flights online? If you mean an Amex voucher, you can only use that on BA flights (starting from the UK). Do they have a fresh crew to operate the MAD – FRA – MAD? Lol seriously you ask this? I’ve flown the same sector – however I consider this an average review. It does not point out the excellent service onboard. The cabin is very spacious, and tbh if you don’t like the cabin configuration, then you have a problem. i really like to get to know people and chat when flying – I’ve never had an issue with that (nor does the other passenger!). Secondly, the service carried out by the crew is professional, exceeding all expectations. As someone already pointed out, there’s a proper introduction: “hi my name is this and I’m going to be your attendant today. Please let me know whether I can assist you or help you with anything”. Which is just great! Anika did not wrote something unique about the experience flying Latam: you get pisco-sour! Which other airline serves you pisco-sour? Probably a handful of airlines do. 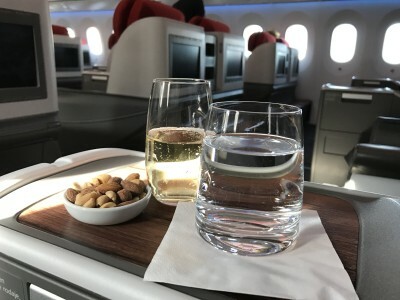 Nevertheless the choice of wines on board is excellent – I got a whole review of the wine selection; the crew went an extra mile sharing with me their whole experience while visiting some of the wine cellars! How great is that? And finally, even though I must admit that’s only true if you speak and understand Spanish, but flying with Latam is quite exotic: people from Latin America are very kind, warm an cheerful, and they will do everything to not let you down! The same applies to the crew in this flight! And also, their accent is very pleasant. Finally, would I fly it again? Probably yes, but only if necessary and when there’s no other feasible option available. The passport control at both ends are a bit annoying – that’s why their load factors are low and fares a dirt cheap. Have to admit I’m the same. I think this is quite a British problem! +1. I’m afraid conversation just aint happening. I can understand that to a degree, but the horror being expressed on here because you can see other passengers is quite hilarious (to put it politely!). I’m pretty sure there is a privacy screen between the armrests that you can raise up if you want. The 4 or 5 times I’ve flown TAM metal in J the cabin has been half full every time though and every solo traveller had at least 2 seats to themselves. Although you may not get a crew that speak much English, I’ve found TAM/LATAM to provide catering, entertainment and service way ahead of BA’s. I find the bed more comfortable too and the S America hub lounges are excellent. Is there a reason airlines can’t put up some sort of wee privacy screen you can pull out so you feel less close to your neighbour? It’s even the same on Qatar 777. I did exactly the same one way trip about a year ago and it was a 170-ish euros well spent. The seats as depicted above look a little different, then maybe I was on a 787-800 (?). I’m a fan of these seats. I would trade privacy for unlimited foot room any day. 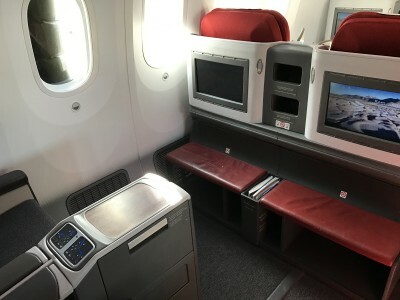 Most J seats today are suffocating, with dismal space for feet in bed mode. This is a nice change. I flew FRA to MAD last year, only 98euro in J, which was very good price. However, the flight arrive MAD a bit late. I also watched Snowden on a flight recently (though on different airline and a different route)! Just wondering why they include it so heavily into IFE systems – perhaps because an airport is featured there? Also – how did you manage to squeeze it in into your flight time? The film is over 2 hours!